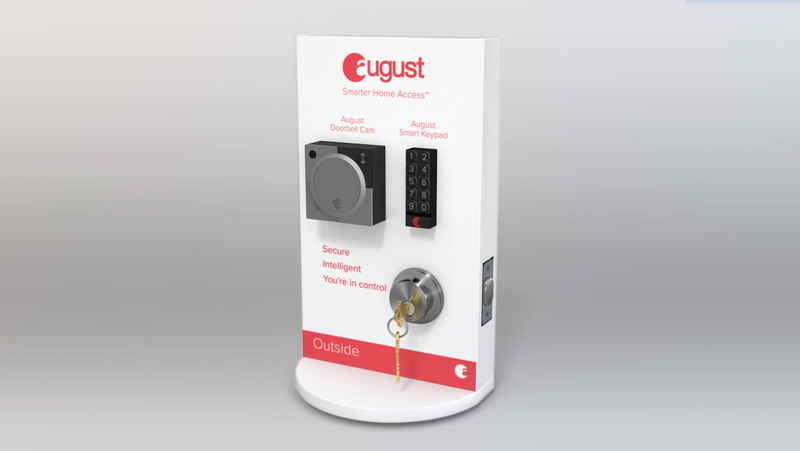 This portable display allows the August sales team and reps to bring a working sample of the entire product line into sales meetings for a clear product demonstration that helps to illustrate the key benefits of the products. This display is uniquely powered with 24 volts AC, which is standard for US doorbells, but almost unheard-of for other purposes and requiring a custom power adapter. 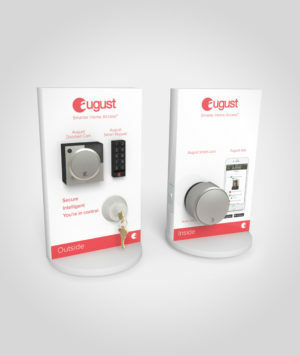 The display also swivels so that the presentation can easily include the user experience from both inside and outside the front door. 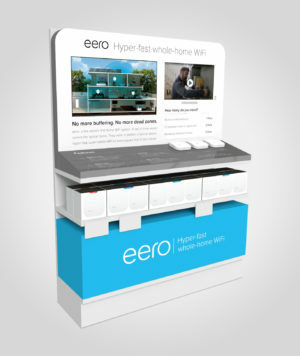 This endcap display was designed for a new Best Buy “connected garage” concept. 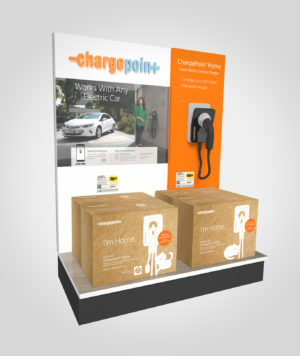 As this is ChargePoint’s first foray into retail sales, we helped guide them through the process of designing an effective retail display and working with Best Buy. See it at your local Best Buy store. Click here to jump to our packaging section and see the retail packaging we developed in conjunction with this display project. 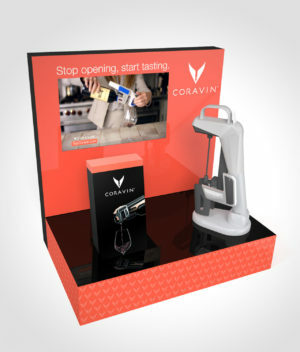 This free-standing counter display attracts and educates shoppers about a new way to drink wine. Coravin had a similar display, but wanted to enhance the perceived quality. Building this display of acrylic really enhances the appearance. 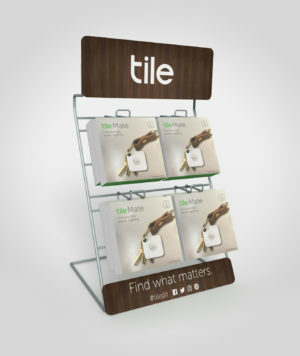 See it at your local Bed Bath and Beyond, Total Wine or Sur la Table store. 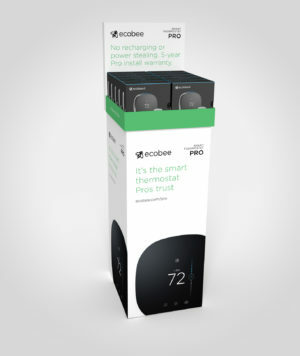 For this temporary display, ecobee wanted a low-cost solution that would also be portable and easy to assemble, but with great store presence when completed. The goal was a display that could fit into the trunk of a car, and be assembled by regional sales reps as they make their sales calls. You can see this display at your local Gemaire Heating and Cooling Supply. 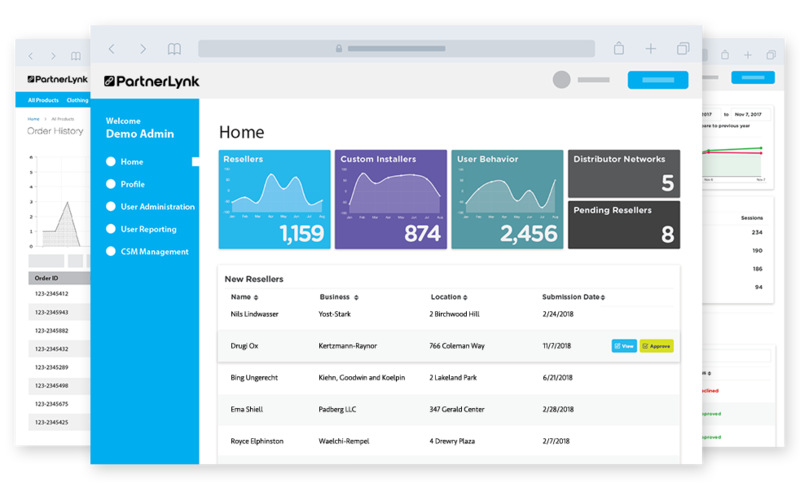 When eero was presented with an opportunity to secure endcap placement in Microcenter and Fry’s stores, they needed a display that would position their brand amongst all the other category leaders. We designed a large acrylic display that includes demo product as well as backlit graphic content to attract shoppers and a large video player to educate shoppers on key product benefits. 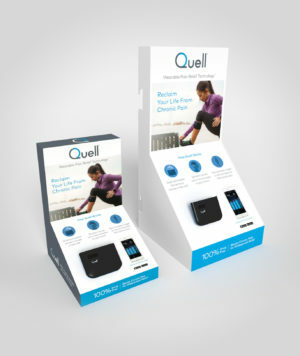 Quell was looking for a value-priced solution to showcase their wearable pain relief technology. We designed a small free-standing display that showcases the product so shoppers can get a first-hand look at the future of pain relief. See this display at your local Bed Bath and Beyond store (you can also see it’s big sister with steel construction, LED lighting effects and backlit logo at Best Buy). 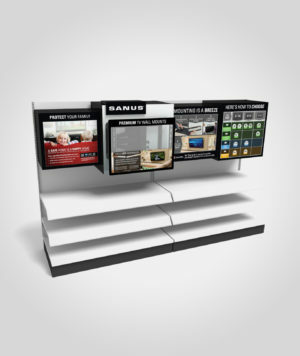 We have built many displays for SANUS wall mounts. You can see our SANUS displays in Walmart, Target, Best Buy, Costco and most other major CE retailers. This display is very unique in design. We had recently introduced a new brand image for SANUS, built around black rectangles, and we brought the brand image to 3D life with this display. And the most unique part is the entire display was designed so that each of the cubes nestles inside the next bigger one. This entire dimensional 8’ wide display ships in one small box. Not all displays are big and fancy. We love building simple displays as well. This is a counter-top wire rack display built of welded steel wire, and designed to present Tile product at the point of impulse purchase.